Later today we will have a new show at enelyst (live chat combined with images), where we will take a closer look at the Eagle Ford, on which we reported last week. The show will be available here in the enelyst ShaleProfile Briefings channel. If you are not an enelyst member yet, you can sign up for free at enelyst.com. I’m looking at the Ultimate Recovery tab and graphing wells by Quarter of first flow. It seems like the trajectory of the quarterly vintages really improved starting in 4Q13. That trend of continued sequential improvements seemed to steadily continue until 3Q16. However, if I look at each quarterly vintage from 3Q16 to 2Q18, I don’t see much of a change. Does this suggest we have seen a plateauing of Permian well productivity? Further, I haven’t seen this data, but anecdotally I’ve heard that lateral lengths and proppant usage continued to increase throughout this time period. So are we actually seeing a deterioration in well productivity inclusive of changes in lateral lengths+proppant? Is this a fair way to judge a basin’s productivity? I believe that we are indeed seeing some preliminary signs here that well productivity is plateauing in the Permian. And indeed this is not even normalized for the increases in lateral lengths and proppant loadings that happened during this period. We have detailed data on these well design parameters, so if you would like to understand this topic in more detail, I’ll be happy to give you an online demo of our analytics service, for which you can also request a free trial. 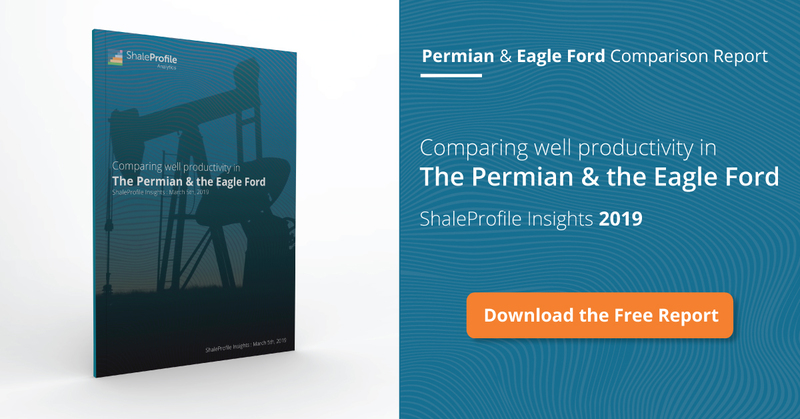 Another question – I know I’ve seen a number of analyses that call into question the unit economics of shale. If we extrapolate the 3Q16-current Permian vintages, it looks like we would be significantly above 400k EUR for oil alone. Unless D&C costs have spiralled out of control, that seems quite workable. Am I missing something? At the moment un-hedged oil in the Permian (+70%?) is below $40. If we ignore that as being a short term anomaly and use $50 net back after marketing differentials one must deduct 7% severance and ad valorem tax, 25% royalty burdens, $10 per BO incremental lift costs, $3 per BO G&A and $2.00 per BO interest costs and we come up with something in the order of $18-20 per BO take home pay. For many, interest costs per BO are higher than $2. Well costs in the Delaware are $9MM plus and in the Midland $8MM plus. I am privy to numerous $10.5MM AFE’s in the Delaware. 400K BO does NOT work. At current prices 800K BO does not work. Last I heard if you can sell associated gas in the Permian, thru Waha you could get maybe 51 cents per MMBTU. There are numerous analysis floating around, by smart oil people, regarding the (low) percentage of shale oil producers that had FCF in 3Q18, when WTI Cushing averaged nearly $70. That’s a great suggestion, and something we can easily add to our subscription service.